:3c This is the 1st time I made a mod. This only works for Don't Starve Together. 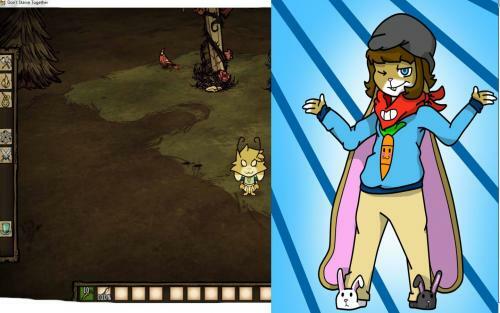 Made Randy as Don't Starve Rabbit as possible. He lost his Beanie and his bunnie flops while he was running away from hounds. Gonna make it a comic too! Health = 100 Sanity = 100 Hunger = 100 Perks *Is fast, strong, and omnivore. *Has low hp, sanity and fast depletion of hunger. *Has free carrots and fishing rod. Abilities *Is really fast and a bit strong. Can eat meat too! Soon *Will gain health and sanity every carrots eaten. *Will lose little Sanity if a Gobbler is killed. *Custom Speeches and all. *Maybe change the Sanity to 90 or something? *The art... Yes... Maybe... Never... Dunno. If I get pumped up and all. Art by: Me. Of Course! And stuff... Hope you enjoy!